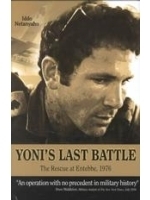 Yoni’s Last Battle is a gripping account of the famous operation in Entebbe, Uganda in July 4, 1976. While the nation of Israel, and Jews throughout the world, struggle with the painful realities of the current Intifada, Yoni's Last Battle by Iddo Netanyahu returns to an earlier chapter of the Arab-Israeli struggle – to a time when the battles were more clear-cut, and genuine heroes led the charge. Yoni’s Last Battle: The Rescue at Entebbe, 1976 is a gripping account of the operation. In extraordinary detail, Dr. Iddo Netanyahu –Yoni’s youngest brother, and also brother to former Israeli Prime Minister Binyamin (Bibi) Netanyahu – reconstructs events to portray a minute-to-minute chronicle of one of the earliest and most spectacular victories in the modern war against terrorism. Based on interviews with almost every member of the operation, Yoni's Last Battle is a fascinating and first-hand account of the intense 48-hour period of planning and preparation of the mission, and its near-perfect execution in extremely difficult circumstances. Yoni’s Last Battle is also an intriguing portrayal of Yoni himself, who at the age of 30, was the brilliant and heroic commander of a courageous and daring mission.